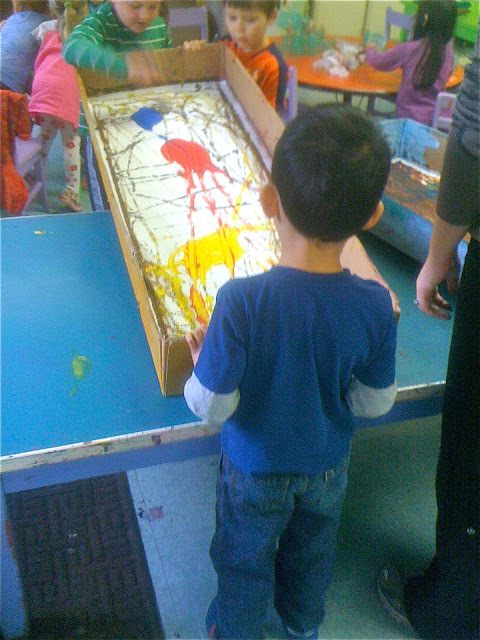 One of the aspects I like most about teaching in a cooperative preschool is that parents directly witness their child's processes: creating art, building with blocks, exploring sensory materials, assembling puzzles, and working with others. As a teacher, I don't need to be constantly "documenting" a student's work and reporting to parents about how and what their child is doing. As a parent I saw this as a primary advantage as well, not having to rely exclusively on the teacher for information about my child, but rather seeing with my own eyes, or the perspective of my fellow parent-teachers, how my child was doing in her process of getting along with the world. 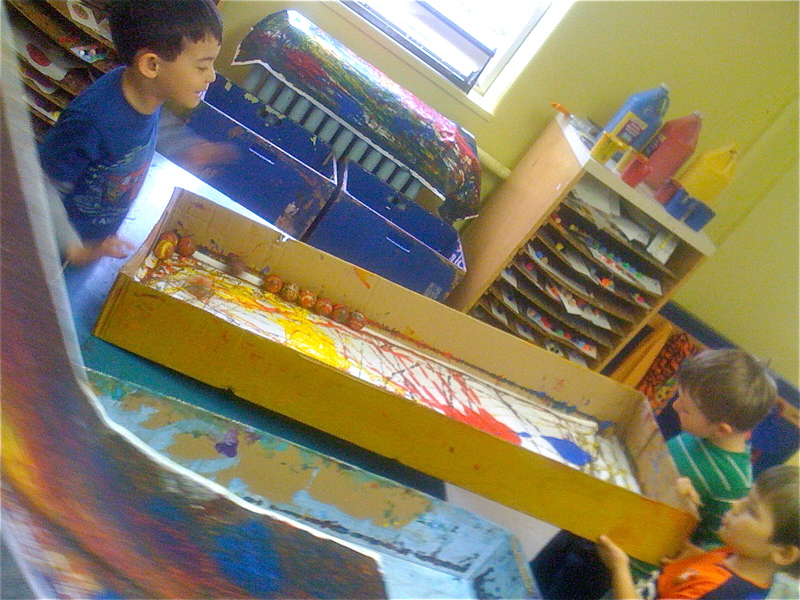 Practicing working together is the most important thing we do in preschool. This artwork won't be going home with the kids as a kind of "product report" on what they did today. In fact nothing of this will go home other than the experience gained from the process. 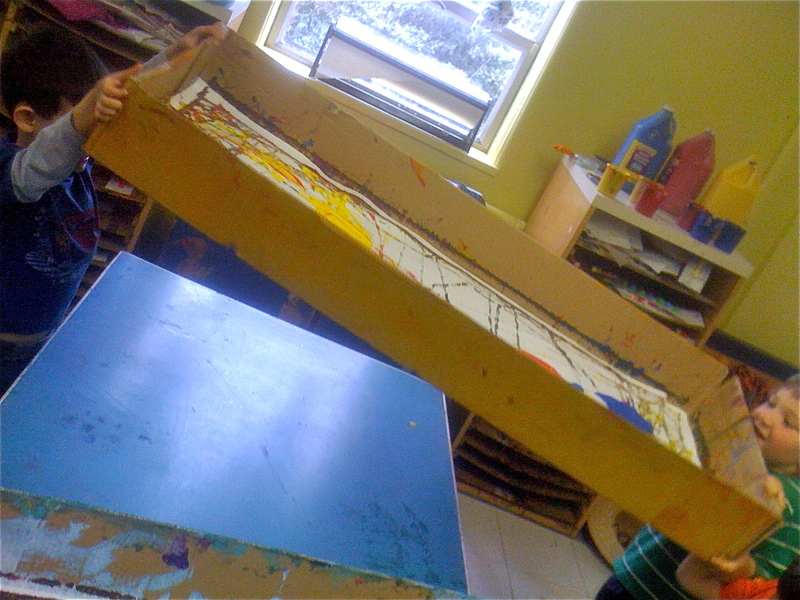 We usually talk about process v. product in relation to art, but in preschool it really applies to everything we do. 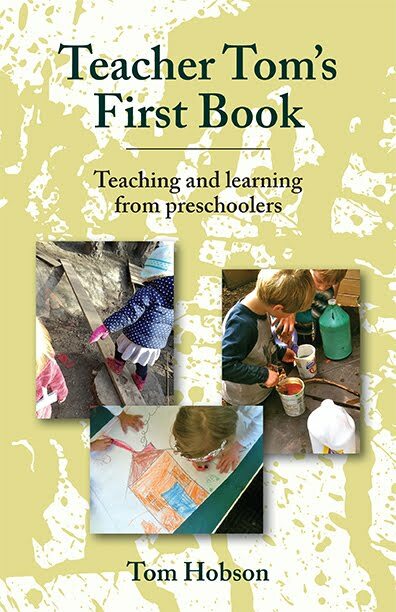 I know that conscientious teachers strive to include process in their documentation and reporting on a child's work, attempting to show or demonstrate, for instance, not just that a child built an elaborate castle from blocks, but how it came about. The reality, however, of a teacher or two with a classroom full of children quite often means that what parents are left with are progress reports on product. This is especially true as report cards and 30 minute parent-teacher conferences come to dominate what is typically a one-way flow of information about the results of tests, homework, and grades. I suppose I drove my daughter Josephine's kindergarten teacher a little crazy at times in the way I almost dismissed her official reports, preferring frequent, casual hallway conversations about how, not what, she was doing. In fact, when I sat down for parent-teacher conferences, I always let the teachers know that I was far more interested in discussing how she was getting along with her classmates than anything to do with grades. After all, social skills have far more to do with success in life than do academic ones, and that's information that awfully hard to package up into a report. Some of the kids negotiate a process that involves "covering all the white parts." It continues to be incredibly valuable to me as a parent, even as Josephine is now a young woman, to have been an eye-witness to her preschool trials and struggles, especially in the area of exploring relationships. As any psychologist will tell you, this is where you need to go for therapy to work, and many of our issues in adult relationships can be traced right back to those earliest ones. I can't tell you how often, over the years, that I've found myself reminding Josephine of events and friendships from our cooperative preschool days as we've discussed her current social challenges. Some teams are find themselves more interested in the patterns they can make together with the tracks made by the golf balls as they roll through the paint. It might sound odd at first, but I often discourage parent-teachers from reading books (or at least, reading book after book) to kids during class. Of course, I have nothing against books, but our classroom time is relatively short and sitting on a lap, in a corner, listening to a story tends to be a rather isolating activity, even if you're sitting in a cluster of other kids. Plus, I know that the kids I teach are being read to at home, so there isn't that concern. As I see it, the primary reason we're at school in the first place is to practice our relationship skills, to experiment with ourselves amidst the other people: that is something one really can't do at home, or at least not nearly as well as we can at school where the playmates aren't hand selected, where there are dozens of individual agendas and personalities to be accommodated, where one must constantly strive to find one's place, to learn to assert oneself, and to know when and how to join right in. While for others, they are more interested in the contact they make with their friends across the way, all part of the process of learning to get along with the other people. The only way to learn these things is to practice, which is a the sort of lifelong process in which most of us find ourselves engaged, both socially and in our jobs. This is why process is always more important than product, and process is something best understood with one's own eyes.